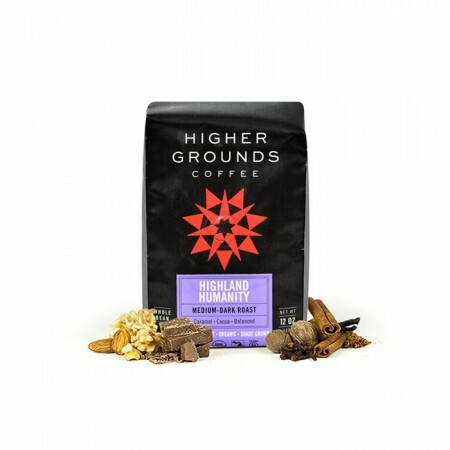 The Highland Humanity was blended and roasted for you by Higher Grounds Coffee. This coffee is a medium light roasted blend of coffees from Mexico. Certified Fair Trade and Organic, this blend was named in honor of the highlands in Chiapas, Mexico, where the origin story of Higher Grounds began. In the cup, we taste balanced and sweet notes of caramel and cocoa. Tried this on a gamble. It’s a well flavored blend, but the toasty taste of anything much past medium is a lot for me. It takes sugar and cream well, which is how I will be drinking this bag. This was medium dark and my profile is light. Please send a replacement as soon as possible since we will not drink this bag. Thank you for replacing the last bag. This one is much better! It's okay, but it isn't my favorite. Tastes a little more bitter than other selections. My settings are light. I would understand receiving a medium coffee, but receiving a medium/dark blend is disappointing. It's a fine coffee if you like dark, it is just well out of my preference, as indicated in my profile. Too dark for my taste. I honestly didn’t think I would like this judging by the description but it was actually quite good. It was remarkably mediocre or boring for my palette. Amazing brew of coffee. To me a good cup of coffee starts when you first open the bag. The aroma that greets you often tells what the cup will be like. This bag set a good standard right from the start. Rich flavor. Smooth and no bitterness. Excellent. This seems bland compared to others. My suspicion is the darker roast. Loved the caramel & cocoa notes!